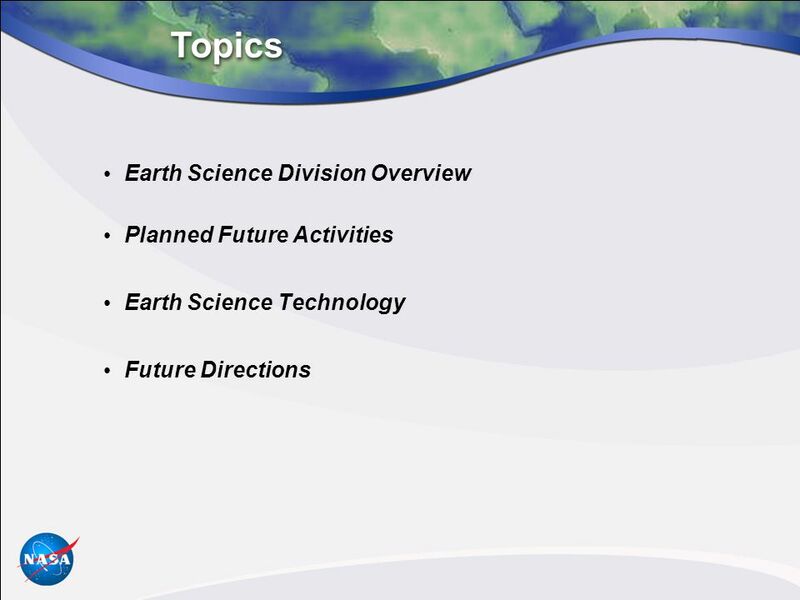 Download ppt "NASA Earth Science Update"
Brian Killough NASA NASA Future Missions Summary CGMS-38 Meeting Delhi, India November 8-12, 2010. 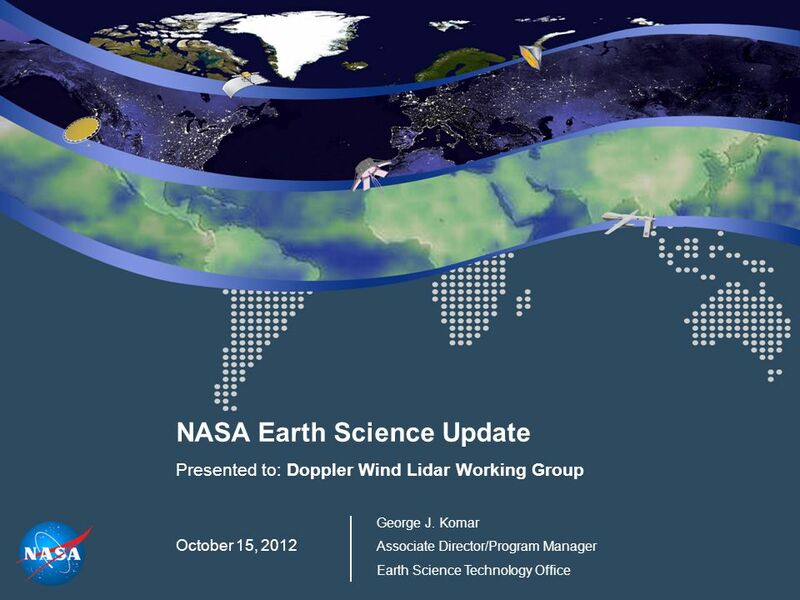 LANDSAT Program Update Tim Newman Coordinator, USGS Land Remote Sensing Program National Geospatial Advisory Committee December 3, 2014. 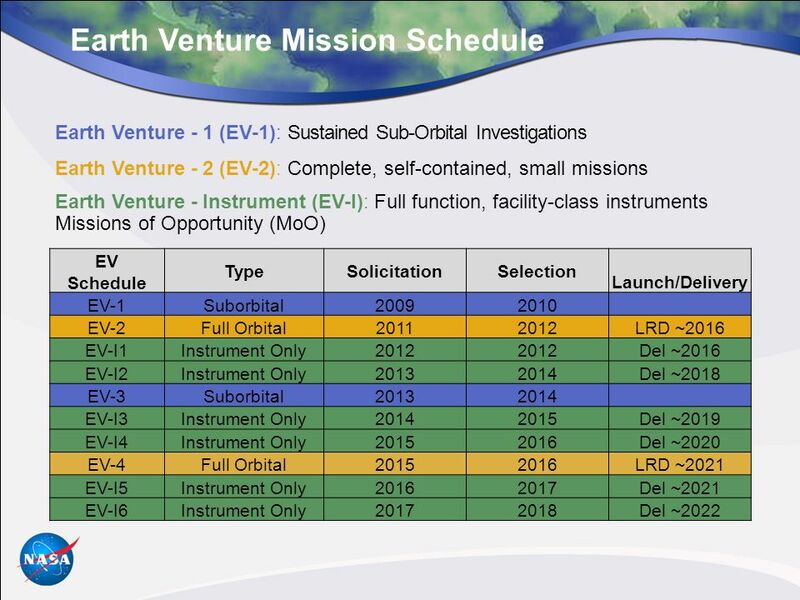 Meteorological Service of Canada – Update Meteorological Service of Canada – Update NOAA Satellite Proving Ground/User-Readiness June 2, 2014 David Bradley. 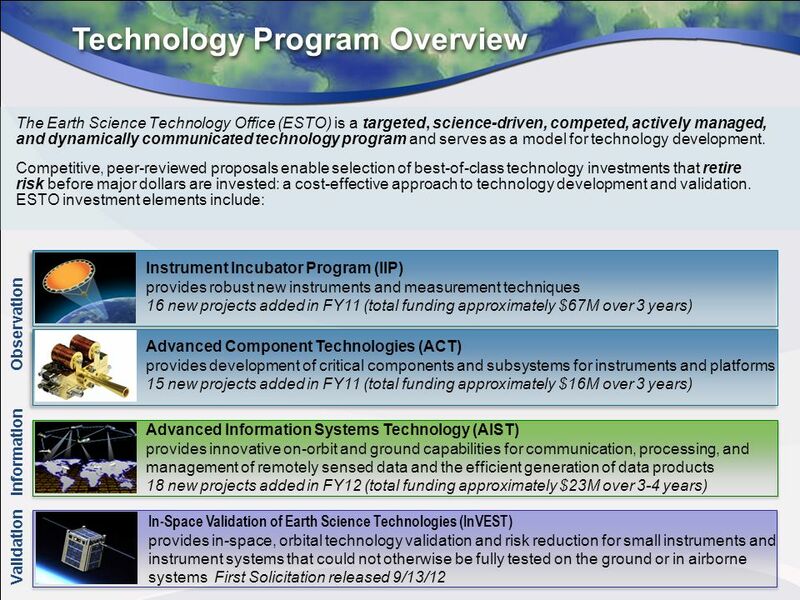 Space Technology Programs James Reuther Office of the Chief Technologist March 28, 2012 Office of the Chief Technologist. 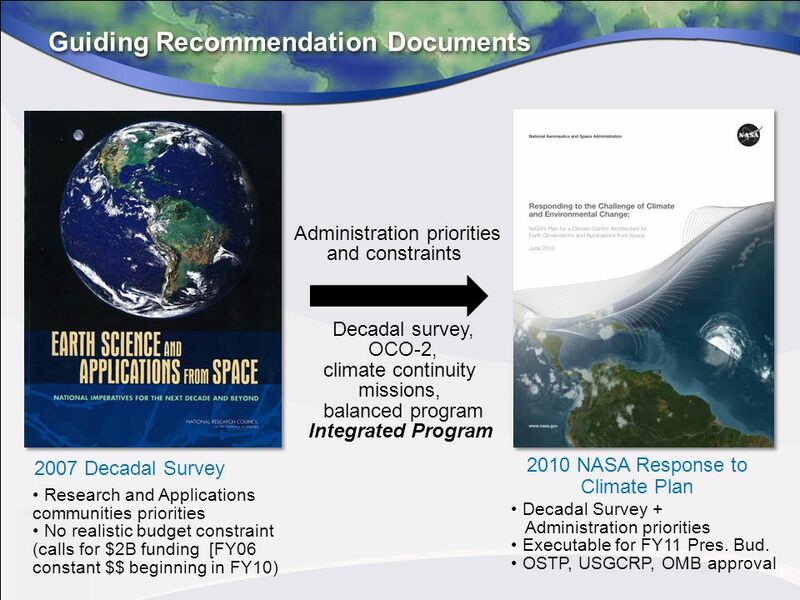 National Oceanic and Atmospheric Administration FY 2015 Budget Submission March 18, 2014. 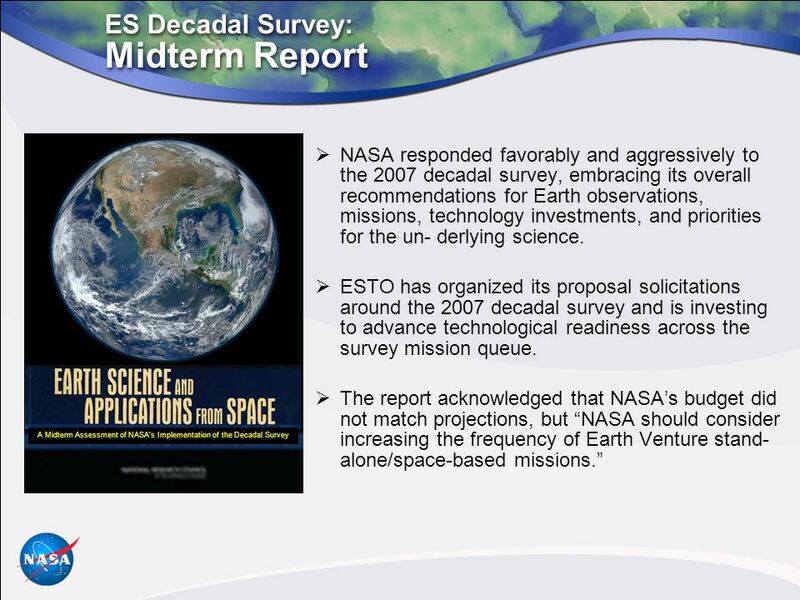 Earth System Science Teachers of the Deaf Workshop, August 2004 S.O.A.R. 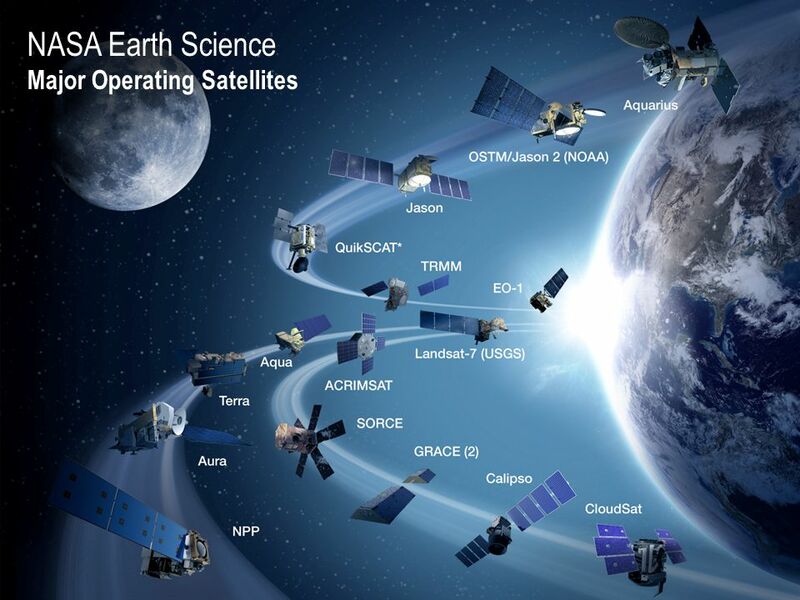 High Earth Observing Satellites. Preliminary management plan for PACE SDT What are the Goals of PACE? 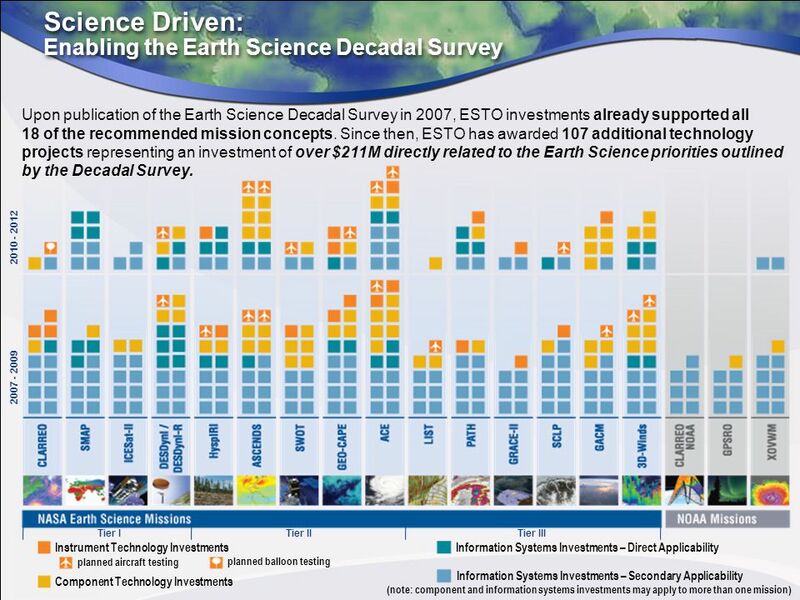 The goals of the PACE mission are: 1-Extend key climate data records on ocean color. February High Impact Weather Workshop 1 JCSDA-HFIP and -ECMWF Workshop Recommendations Lars Peter Riishojgaard and Sid Boukabara Joint Center for. 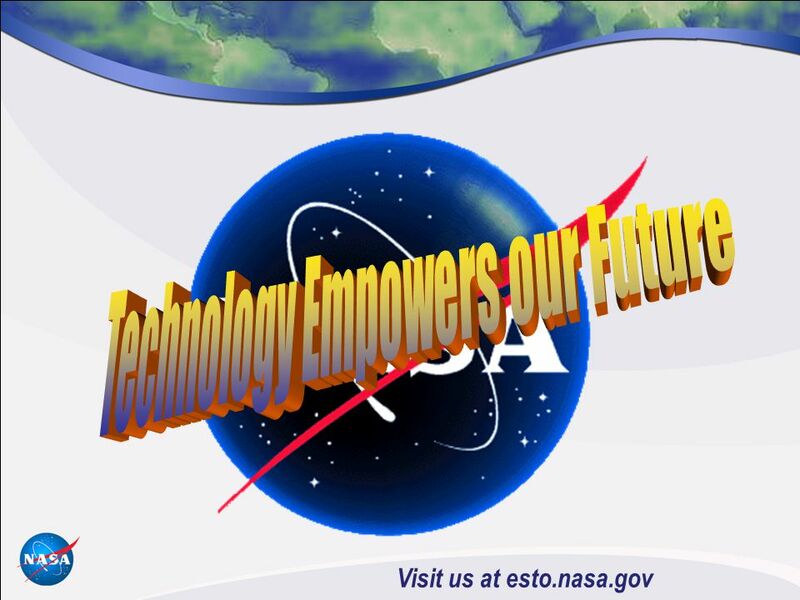 A NASA Headquarters Perspective August 24, 2010 George J. Komar Associate Director/Program Manager Earth Science Technology Office. 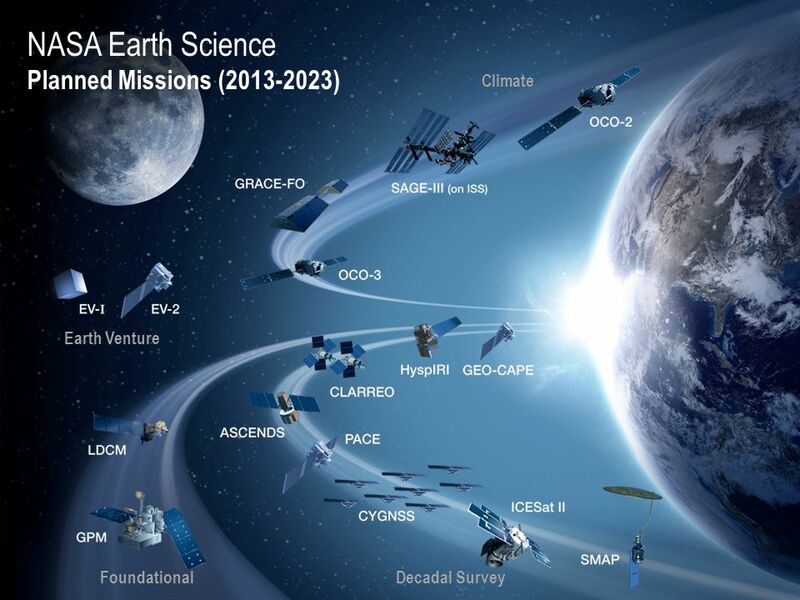 EARTH SCIENCE INITIATIVE to respond to the NRC Decadal Survey, Earth Science and Applications from Space: National Imperatives for the Next Decade and. 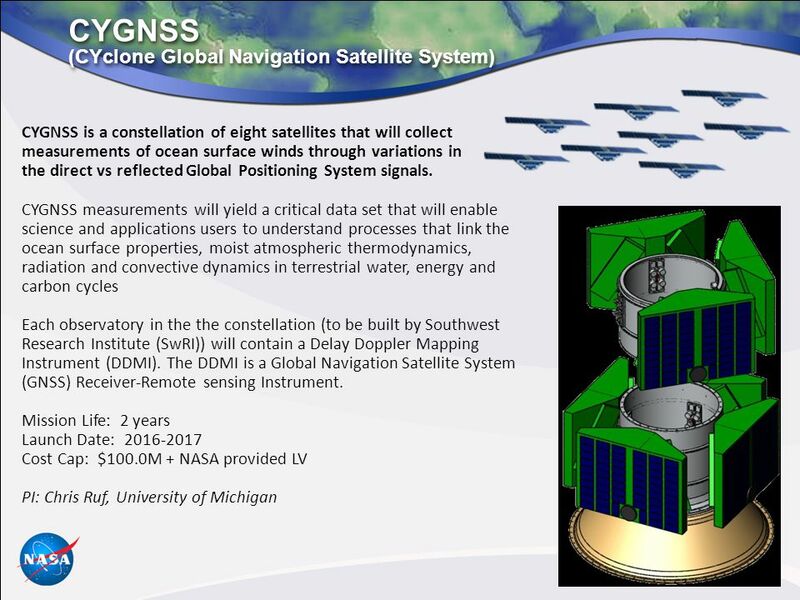 Training and Education for NOAA Space-based Remote Sensing Programs – FY06 to FY10 Anthony Mostek NWS – OCWWS – Training Division – VISIT Anthony Mostek. 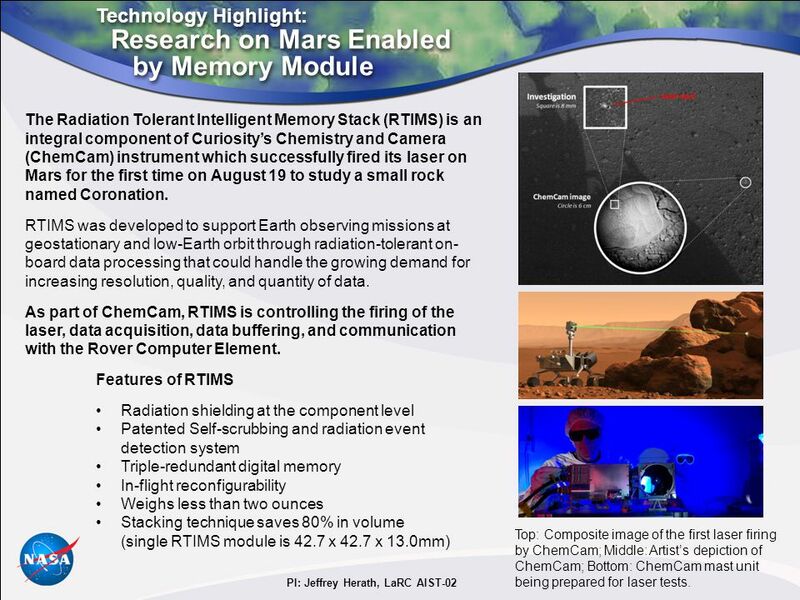 Developing Technology for NASA Earth Science Technology Strategy Panel, 50 th Goddard Memorial Symposium March 28, 2012 Robert Bauer Deputy Director Earth. ASPRS, a New CAP Partner Michael Hauck Executive Director, ASPRS.